Headlines: Fishing over the weekend has been positive despite some cold mornings and Southerly winds. Eucumbene has been producing some great bank fishing and good trolling. 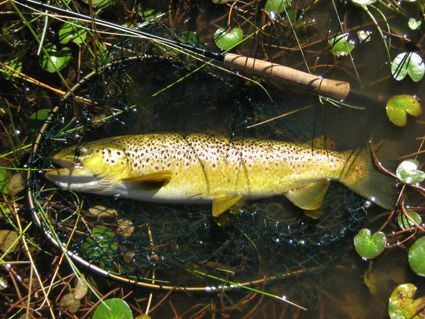 Rivers:- The river fishing has been great in the streams. Levels have dropped slightly but fish numbers are still high. The Thredbo and Eucumbene are both very clear at present which means long, light leaders and a very stealthy approach. There is some great river polaroiding to be had when the water is very clear and the upper reaches of the Thredbo in particular have produced some really good Browns. On the Eucumbene the fishing has been similar to that in the the Thredbo. Searching or casting at a sighted fish with a dry has been working well in the glides and slow pools. A dry indicator with a weighted nymph has been the best option in the faster runs at the head of pools. Found the lake very quiet Friday night, cold southerly wind & no fish moving. Had better luck fishing the river on Sunday for a couple of hours. The fish in the photo went 3lbs in the weigh net, it is the second fish I hooked the first which was much larger ran 40 metres to the nearest weed bed and weeded me. After extraction it subsequently ran another 20 metres downstream burying itself in weed again and busting me off. I dont think it knew what it was doing, in this circumstance the 4 wt felt a little under gunned. Might see you tomorrow night if this easterly wind goes away, need to get some mad rainbows out of the lake. Lake Eucumbene:- The lake is firing big time. Mudeye hatches have slowed a little, but there are still a stack of fish coming in close of and evening and the early morning. Location is all important. Bays with lots of grass weed are ideal. The bottom end of the lake has been excellent from Buckenderra through to Seven Gates. The top end has produced some good fish too, but reports suggest numbers have not been quite as good. There is a heap of food in the water at present too with Damsels Nymphs, Corixa, Mudeyes, Snails and Caddis being plentiful. Lake Jindabyne:- Reports from Jindabyne continue to be scarce and the way Eucumbene is fishing it would most likely be a better option. Crickhoppers and Rebel Hellgramite have been good especially the larger model. The yellow and green patterns has been the best colour. Fenders with a soft plastic have been good too. Tassies in Y48 and Lofty's 100Y have taken good fish. *Mario, maker of the amazing Snowy Minnow, had a great session on Friday spinning in the dam. He caught eight Rainbows between 12.30 and 4pm on his little lure. That is a top session in the middle of the day. Best areas have been Seven Gates, Waiunui, Collingwoood, Coppermine and Main basin. *Ahmed and Aduni El Saddik came up to the Snowy Mountains from Sydney after reading last weeks report and had a great session at Buckenderra. They managed seven Rainbows and two Browns with the biggest going 1.5kg. Three ate Mudeyes, three ate Powerbait and the others were on Tassies while spinning. A great evening session was had and despite being near frozen overnight (it does get very cold at times) they are sure to be back for the great fishing. *Guys, just a quick report. Went up to Lake Eucumbene with my son Nick and a mate Corro on Saturday night 01 March 2008. Blowing a disgustingly cold southerly. Corro and myself flyfished while I set the young fella up with some powerbait in the lemon twist. 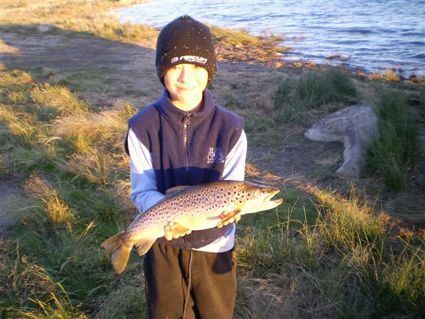 He outfished us with this thumping brownie that ran him ragged on 1kg line. Great fight and made the trip worthwhile.